The yield curve in Canada shows signs of inverting. We need to watch this carefully as it is a strong indicator that we are heading towards a recession. 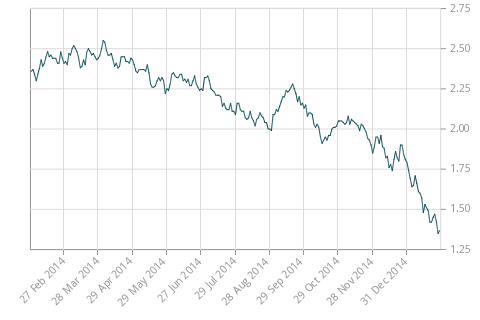 This week the rate on 3-month Canadian t-bills went higher than all the other rates out to the 5-year bond. Economic actors prefer present goods to future goods, so future goods can only be exchanged for present goods at a discount. This gives rise to the phenomenon of interest (hence the term “discount rate” in finance when determining the present value of future cash flows). The normal yield curve shows that the farther out in time you go for the maturity date, the higher the interest rate. There are two basic reasons. First, there is the issue of inflation, and lenders must take into account the depreciation of the monetary unit over time. Because the money supply is always expanding, the purchasing power of money tends to fall over time. Money paid back in the future is worth less with each passing year. The second reason for the normal yield curve shape is that the default risk increases over time. The risk of default might be quite low over one year. But over ten years? Twenty years? Uncertainty is greater over that time period. The longer the debt takes to mature, the more one is subject to default risk, and so lenders compensate for this by demanding a higher rate of return. This explains the shape of the normal yield curve. But there are unusual situations where the yield curve inverts — the short maturity end of the curve has a higher rate than longer-term debt. This is not normal, for reasons that should be obvious in light of the preceding discussion. Putting aside the yield on the 1-month t-bill, we can usually assume that if the 3-month t-bill has a higher rate than the 30-year bond, the economy is going into a recession. This implies a short-term liquidity crunch. Borrowers are starting to panic over their misguided investments due to artificially low short-term rates. They see impending losses. They will pay more for a 90-day loan than for a locked-in 5-year loan. Meanwhile, the lenders are growing fearful about the short-term state of the economy as well. A recession pushes interest rates lower because the economy is weaker. Lenders are willing to give up the inflation premium they normally require. They nail down today’s higher long-term rates by purchasing more long-term bonds — which raises their price, and pushes down the rate. Remember, when central banks are expanding the money supply, they buy up short-term t-bills to bid up their prices and push down their yields. The monetary expansion misallocates capital — investors and businessmen put more money into projects than the “real” economy can support, hence the “boom” phase preceding the “bust.” An inverted yield curve — rising short-term rates — signifies a liquidity shortage. Money is desperately needed right now to sustain capital projects. (A detailed scholarly treatment of this issue can be found here — it’s a Ph.D dissertation, so it’s interesting albeit kind of dull). So the inversion of the yield curve normally signals a recession. However, the yield curve is not fully inverted. The 3-month bill’s rate is still less than the 10- and 30-year bond rate. But these longer-term rates are plummeting rapidly. And the 30-year treasury bond is plummeting as well — investors are giving the Canadian government their money for 1.833%, when just four weeks ago it was 2.3%. A year ago it was a solid 100 bps higher. Investors are giving Ottawa their money for less than 2% for 30 years. The world has gone insane. 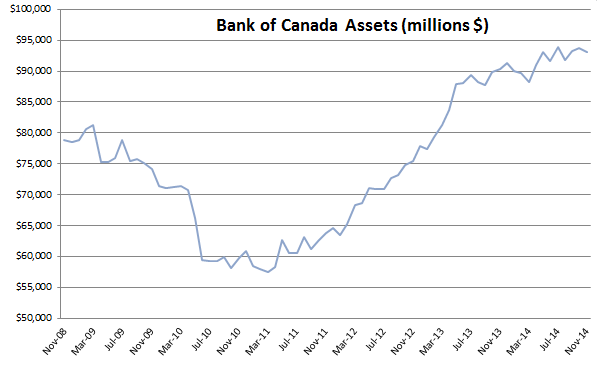 Despite the Bank of Canada’s recent surprise rate cut, the Bank of Canada has been significantly slowing the rate of growth of its asset purchases in recent months, as I reported a few weeks ago. At the same time, down south, the Federal Reserve — the central bank of our biggest trading partner — has ended QE3 and its balance sheet no longer showing any net growth. I am not clear how the BoC’s recent rate cut will factor into this, nor am I clear what Yellen and the Fed will do if the US economy shows signs of panic (QE4? ), but I think the inversion of our yield curve is related to all this. Remember, short-term rates are lowered by periods of central bank monetary expansion because they buy up debt at the short end of the curve with newly created money. All signs have pointed to the end or at least slow down of high monetary inflation by these central banks. Businessmen who thought all this investment in capital was justified because of distorted interest rates are getting a wake-up call. The truth is manifesting in the debt markets. So watch the yield curve in Canada closely in the near future. If the 3-month rate goes above the 30-year rate, I’d say there is a 90% chance of recession within six months. If the inversion doesn’t go all the way out to the 30-year, then it may not indicate recession but it still suggests slower growth going forward. On March 6, I wrote about how gold holds up far better than silver when a panic hits. Recent events seem to provide confirmation of this. Silver at its peak was $48.70 in 2011. It is now at $23.29. This is a 52% loss — ouch. That is very painful for someone who bought near the top. Gold has weathered the panic with much more success. In 2011, gold hit $1913 and it now is trading at $1391. This is only a 27% loss. Harsh, but not so harsh that you would want to throw yourself off a cliff. As a speculative play, you could see big profits if you buy silver near the bottom. That’s because, relative to gold, silver is tremendously volatile. But you need to be careful: you may recall that during October 2008, silver traded below $9. Panics hits silver hard. Unless we enter Great Depression 2, I doubt silver will fall that low again — but I think it could certainly drop below $20 before this shake-up is resolved. Is Now the Time to Get Out of the Stock Market? Last week gold and silver got killed, especially after the rumor hit that Cyprus would sell gold to get a big fat bailout (honestly I doubt that will happen). The slaughter continued today. I am writing this with gold at $1365. Margin calls are probably dropping left and right. Other commodities have fallen, including oil. Bonds have rallied recently. The 30-year Treasury offers less than 3%, which is pretty much completely crazy. Meanwhile, Canada lost 54,000 jobs in March — the worst employment update in four years. 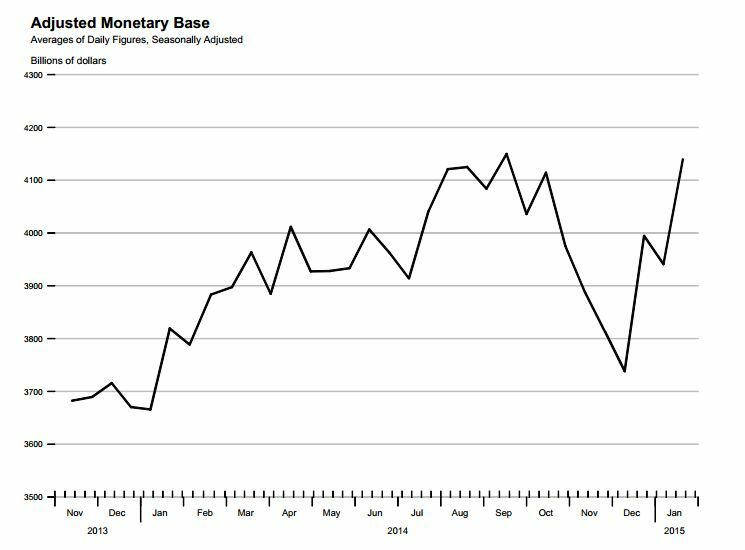 To me, these are pieces of data which imply an economic correction trying to work itself out, rather than a rippin’ recovery. If these developments justify concerns about a slowing economy, then you want to be careful about the mainstream coverage about this gold panic, and their general frenzy about buying stocks. US stocks, which are the hot ticket these days, seem to me dangerously high. Corporate earnings in the US are 70% above their historical average due to massive fiscal profligacy by government and citizenry, and aggressive cost-cutting post-2008. Periods of strong corporate profits are never permanent and eventually regress towards the mean. Therefore it should be expected that future earnings and dividends will disappoint. The Fed is struggling to perpetuate the error cycle and keep the ‘recovery’ going. Meanwhile, the TSX is not performing well this year, after being one of the world’s worst stock markets in 2012. And the TSX-V — which is where all the most exciting action is — is going to get smaller. The average level of cash held by TSX-V-listed stocks has fallen from $4.3 million in mid-2011 to about $2.8 million now. This might not sound too bad because it is still several times higher than pre-2008 levels, but on a per-share basis, it is terrible. TSX-V companies have only about 2.8 cents per share as of last quarter, a drop of more than 50% in two years. Remember, these companies don’t usually generate their own cash flows from any operations, and cash is frequently their only good asset. All the while, TSX-V companies have doubled their liabilities per share — so when the nearly 2.6 cents per share is paid off, they are basically broke. So while this says nothing about any individual companies, it suggests the junior resource sector is going to come up on some hard times. I absolutely expect Canada and the US to join the other developed nations suffering from recession. If you hold stocks at this time, you should seriously think about just selling most or all of them. Be ruthless about keeping only the absolute best ones. Keep the balance in cash and patiently await buying opportunities as prices fall. If you are a long-term believer in gold, this is clearly a huge buying opportunity. Gold could still fall another 10-15% before hitting a bottom, and it could take a 6-12 months to recover. I would like to point out that during the previous gold market, there was a 20% price drop in late 1978. We know how that turned out. Yet, if the fundamental argument for gold is still sound, then today’s prices are a godsend. Many people want to know about silver. They want to know how it compares to gold as an investment. Some call silver a “poor man’s gold.” In other words, the average man on the street is more able to go to a dealer and buy a few ounces of silver than he is a few ounces of gold. Yet “poor man’s gold” is not a fair characterization, because it assumes silver and gold belong in the same category simply because they are both precious metals. The reality is that silver and gold are different in important ways. I recommend that one’s precious metal holdings be MAXIMUM 25% silver. 15% is probably better. Gold should make up the rest. First, I invite you to check out the Kitco charts and look at recent price behavior. In April 2011, silver reached a high of $49. But by June 2012, it hit $27. As I write this, it is $29. Measured from the 2011 highs, this is a massive loss. Nearly 50%. Now look at gold. In September 2011, gold hit a high of $1895. In May 2012, it bottomed at $1540. As of right now, it is $1580. Measured from the 2011 highs, this is a moderate loss. Nearly 20%. The idea reflected here is that silver is much more volatile. Look back to 1980. Silver fell from $50 to $3.60 in 1991. Gold, at its worst, fell from $850 in 1980 to $255 in 2001. It’s like losing your house and all your money, instead of just all your money. So when gold sells off, silver will sell off harder and faster. Silver bulls will argue that the potential gains are much, much higher with silver than with gold. This is plausible, if only because silver is 40% down from its all time high and gold is 17% down from its all time high, and there are strong reasons to believe that both will move upwards. Why the volatility? The primary reason is industrial demand, which for gold is very small. It is significant for silver, however. During a panic, the price for raw materials plummets. Gold is different. You could say it commands a premium. This is essentially because gold is regarded as a monetary metal even though it is not money. Central banks buy and sell gold. They have it in their vaults. Central banks don’t stock silver. Wealthy people want gold in a crisis, and silver is much less interesting. Indian families buy it when their daughters get hitched. Asians use it to protect against inflation. Silver really doesn’t serve that purpose, and I do not believe it will in the near future. Silver will probably have a bigger bull market than gold by the time Great Depression 2 hits. But if you want to buy precious metals because you are afraid of people like Bernanke and Carney, then you want gold. Silver is a higher risk trade. Gold will perform better in a panic, which is when silver will perform horribly. In either case, your objective is to hold until the error cycle reaches its final moments before we enter a deflationary depression. Because at that point, you want to unload all your gold and silver and get currency and bonds from institutions that won’t go broke. It’s a trade that would be harder to time correctly with silver than with gold. All this being said, there is one other important advantage gold has over silver: your wife or girlfriend will like gold jewelry more than silver jewelry.